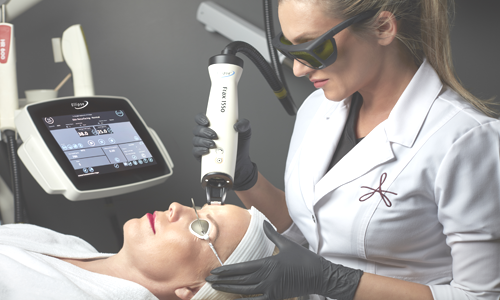 Amae Med Spa offers the newest technologies by Fraxel, Nordlys by Ellipse & ThermiSmooth for non-ablative laser therapy that targets skin imperfections. These safe, effective treatments are effective on uneven skin tones, sun damage, fine lines and wrinkles, acne scars, surgical scars rosacea, telangiectasia, laser hair removal, and more. Laser treatments renews the skin’s surface, giving your skin a refreshed, youthful glow by treating the skin’s surface using light energy to stimulate collagen, and resurface the top skin layer. This diminishes scars, fine lines and wrinkles – reversing imperfections & the visible signs of aging. Each Laser Treatment begins with a professional skin consultation. Treatments are optimized to meet the specific needs of each client with the most innovative and comprehensive products and technologies. 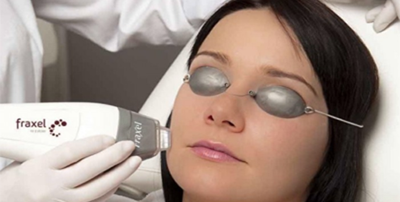 For optimal results we recommend purchasing a package of laser treatments under the guidance of your aesthetician. As we age, our muscles weaken and can no longer hold up our skin as tightly. This results in the formation of fine lines and wrinkles. ThermiSmooth uses radio-frequency to heat the skin and stimulate natural production of collagen. This helps strengthen and thicken the skin to improve its overall quality and appearance. A series of treatments is recommended to achieve great results. ThermiSmooth is gentle, and patients often say it feels like receiving a warm massage. Frax 1550 laser is developed for treatments of non-ablative skin resurfacing (including texture, fine lines and wrinkles), stretch marks, acne scars and surgical scars. Best results are achieved in a package of three treatments, four weeks apart. For an affordable, non-invasive, anti-aging treatment – with results you simply can’t get from lotions & creams – consider Fraxel. *Consultation is recommended prior to scheduling a Fraxel Treatment. The Nordlys system works by directing controlled, target-specific pulses of light to the upper skin layer. The light is absorbed by two of the body’s natural chemicals, including melanin in the pigmented areas and hemoglobin in the red blood cells. These pigments utilize the light energy and convert it into heat, which is used to destroy parts of the cells where melanin or pigmentation is stored. The Nordlys light energy is carefully controlled to the optimal pulse length, utilizing just the right amount of energy to destroy imperfections without damaging healthy surrounding tissue. A full-face treatment takes less than 20 minutes. You should see an improvement in your cosmetic concerns with just one treatment, however up to 3 treatments may be recommended for optimal results.